Furthermore, Manhattan has the largest number of Korean restaurants in NYC. Not only do they offer the food of top quality, but they also promise authenticity. 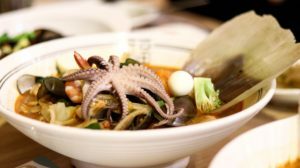 Unlike the barbeque you can find in the South, Korean restaurants will give you an experience like no other. 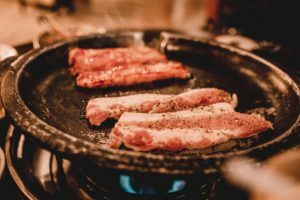 In fact, authentic Korean restaurants require their customers to grill and season their own meat. This gives them an opportunity to enjoy both the cooking process and the meal! So whether you want delicious Korean barbecue or kimbap, Manhattan will surely have the perfect place for you. Atoboy is a popular spot run by a husband and wife who are both Korean. Actually, their focus for the restaurant is to base all dishes on their own family recipes and traditional Korean cuisine. One of their best dishes is the braised eggplant with crab meat in a tomato sauce. However, don’t miss out on their fried chicken in pineapple juice and a ginger-peanut dressing. Also, make sure to try their popular drink mixture of yogurt, cream, and honey! It may sound weird, but you will not regret it. An interesting fact about this restaurant is that it has the Bib Gourmand award. This is a Michelin award for good quality and good value. 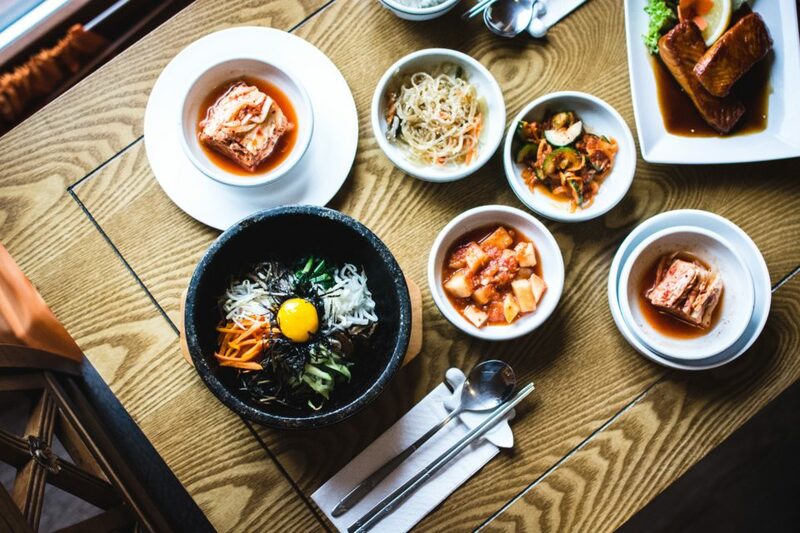 Therefore, if you’re thinking about relocating to Manhattan, know that you will be set with local top-quality Korean food! However, if you’re still stressed about the move, consider hiring Movers Not Shakers. They will make your move stress-free and under control! Cho Dang Gol is an amazing spot if you want to get away from the hustle of the Modernized Koreatown in Manhattan. Namely, their main goal is to offer some of the more rustic Korean dishes. This is exactly what makes it one of the best Korean restaurants in Manhattan. Additionally, it also holds the Michelin award Bib Gourmand! homemade kimchi – fermented cabbage and radish with a spicy pepper sauce. Since Korean cuisine is pretty healthy, it’s perfect for those who want to stay in shape. Specifically, it’s super hard to stay healthy during a move. 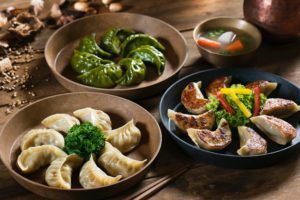 Therefore, don’t hesitate to visit this Korean restaurant if you want a quick and healthy meal during your moving process. Cote is a traditional Korean steakhouse. Its owner, Simon Kim, created it in honor of his love for top quality beef. Consequently, Michelin recognized the quality and awarded this Korean restaurant One Star! Furthermore, one of their most popular dishes is a seemingly simple kimchi stew. However, since it is made with a delicate anchovy soup base with potatoes and zucchini, it’s an amazing experience. Also, their meat selection is out of this world. Specifically, give their aged ribeye and galbi (grilled ribs) a try! Consider adding Korean mushrooms to this combination for a great and filling meal. If you’re in a mood for a festive feast, visit Danji in Hell’s Kitchen, Manhattan. Michelin also gave this place recognition with The Plate, making it one of the best Korean restaurants in Manhattan. 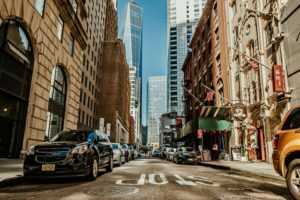 Since it is located in one of the most family-friendly neighborhoods in Manhattan, its focus are creative combinations! One of the top dishes which made this possible is the deep-fried soft tofu with a spicy pepper and ginger vinaigrette and scallions. Moreover, poached daikon radish rings with bok choy in a spicy sauce are also a popular option. Also, their crispy tofu, veggie, and cellophane noodle dumplings are incredible. Namely, these are quite popular among vegetarians in Manhattan. Don’s Bogam is another one of the best Korean restaurants in Manhattan as it received the Michelin Plate. This is a Korean barbecue place in Koreatown, Manhattan. Specifically, it is most famous for amazing grilled meat options! The ultimate option is the unforgettable beef platter. In short, it includes delicately sliced beef and short ribs. Also, mushrooms are usually included for a complete experience. This place is a meat-lovers dream! Moreover, this Korean restaurant strives to be budget-friendly. Because of this, it adds to the pros of living in Manhattan. Therefore, don’t hesitate to relocate to this part of NYC! Miss Korea is a very traditional Korean restaurant which is open for 24 hours! Conveniently, you can find it in the heart of Koreatown in Manhattan. Michelin gave it The Plate and made it one of the best Korean restaurants in Manhattan. What makes it special is the organization. Namely, it spreads over two floors with a completely different vibe. Specifically, the first floor offers a more intense menu with traditional grilling tables. On the other hand, the second floor has private rooms for an intimate dining experience. However, their marinated clay pot short ribs are amazing on both levels! Finally, Michelin awarded Jungsik with two stars! This is due to its both elegant and urban environment. Not only is it cool and modern, but it also gives a traditional experience. Moreover, their modern take on traditional Korean dishes is bold. However, they manage to keep the unique Korean tastes and textures. Because of this, their most popular dishes are ones which are a mixture of traditional and modern. For example, they spice up the traditional tuna kimbap with black truffle rice and mustard giving it a modern twist. Also, their braised octopus in miso soup is a complete experience on its own!